In the Concise Guide To Economics, author and economist Jim Cox correctly explains that the Multiplier is one of the major components of Keynesian policy. For those who still don’t know it, Keynesian economics — named after John Maynard Keynes — are the economics that Barack Obama, as well as George W. Bush (et al), espouse in full. The following explanation of the Multiplier Theory, though exceptionally clear and cogent, gets a bit technical, but please read through it. It is short, and it is also crucial that everyone understands the degree to which economic illiteracy grips the political leaders who have power over us. A bizarre but necessary implication of this theory is that a community which spends 100% of its income (and thus saves 0%) will have an infinite increase in its income–sure beats working! The multiplier is based on a faulty theory of causation and is therefore in actuality nonexistent. Keynesians today will often admit to this but cling to their multiplier by citing the fact that it has a regional effect. Without them saying so explicitly, what this means is that if income is taken from citizens of Georgia and spent in Massachusetts it will benefit the Massachusetts economy(!). The multiplier is an elaborate attempt to obfuscate the issues to excuse government spending. 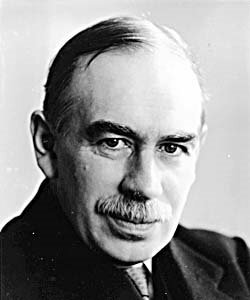 It and Keynesian theory are nothing more than an elaborate version of any monetary crank’s call for inflation; Keynes managed to dredge up the fallacies of the 17th century’s mercantilist views only to relabel them as the “new economics”! Sounds like it is also a wa to defend forced redistribton of wealth. In Canada, we have a Socialst province known as qubec, that recieves a large subsidy from the other provinces by way of the Federal Government. The Province itself has perennial deficeits, but uses these transfers to pay for it’s welfare state. What is multiplied by having language police? how does that improve the Quebec/Canadian Economy? In most areas, the maths don’t add up. Leave it up to a social scientist to come up with the simple equation. The two most abused avenues these days of being scientific are economics and global warming models. Mathematical models, while very sophisticated, are NOT SCIENTIFIC! The scientific method requires empirical evidence. Models portraying partial derivitive forcings with assumed boundary conditions are at most an educated guess. This goes for economic and climate models. The models all fail ad nauseum. These unvalidated, unverified failed computer models are the only support for the economic and global warming 100 year predicgtions as espoused by the IPCC. The math is apparently very basic, nevermind the chaotic system. Hey Ray, forgot to say hi and thank you for all your work. Hi EJ. It’s always good to see you. As Arthur C. Clarke put it – Specifically the third Law. What we have is a group of computer technicians, who have created hugely complicated computer models, and have set them in motion. The numbers that these models spit out are purported to have the ability to predict the future. As Secretary Chu put it. Chu told a conference in California his latest prognostication. “At no other time in the history of science have we been able to say what the future will be 100 years from now,” Chu, the soothsayer, declared according to a June 28, 2009 article in Palo Alto Online News. because they are the only ones who understand how the models work(or don’t) they can claim to know how accurate they are, and are the only judges of their quality(because they don’t share code). At this point after dedicating 20 years of their lives, and having their work potentially directing the future of the world, it is not surprising that they are acting so defensively, and with such secrecy.